If the American Dream depends on skyrocketing debt built on a weakening foundation of stagnant productivity and income, then it is indeed over. Despite a ceaseless propaganda campaign declaring all is well with the U.S. economy, the Status Quo is fragile--and voters know it. Not only do they know the economy--and their financial security--is one crisis away from meltdown, they're also fed up with all the official gerrymandering of data to make the economy appear healthy. The Economy Is Better — Why Don’t Voters Believe It? The American Dream--characterized by plentiful jobs offering living wages, security and opportunities to get ahead--is over, and voters know this, too.People are realizing the U.S. economy has changed qualitatively in the past 20 years, and claims that it's stronger then ever ring hollow to people outside Washington D.C., academic ivory-towers and ideologically driven think-tanks. Many econo-gurus lay the blame for the Great Depression on the Federal Reserve tightening too soon, or not loosening credit enough, but this is nonsense: The Great Depression was the result of credit/borrowing (i.e. debt) outrunning the foundation that supports debt: productivity and income. Piling more debt on a base that isn't expanding fast enough to support skyrocketing debt leads to a collapse of the feebly supported debt: borrowers default, asset prices crash as buyers vanish and lenders go bankrupt as the assets held as collateral are repriced. To suggest that policy tweaks could have averted the collapse of unsupportable debt is absurd. Farmers were leveraging farmland that was already mortgaged to the hilt to buy more land to increase production. When grain prices softened, the debt bubble burst. No policy tweak could reverse the supply-demand imbalance or magically force marginal farmland to suddenly be worth a fortune. When credit expansion gets ahead of productivity and the production of goods, services and income that support all borrowing, the only possible result is a repricing of debt, risk, collateral and assets--that is, a crash. The global central banks have pushed that repricing forward seven years by lowering interest rates to near-zero (or less than zero), enabling borrowers to add more debt even though their incomes have stagnated or declined. But enabling more debt does not reverse supply-demand imbalances or create income out of thin air. As a result, piling on more debt is not a solution; it's simply a politically expedient method to forestall the crisis, while guaranteeing the eventual repricing will be even more severe because the debt load is now so much larger. Unsurprisingly, adding more debt to a weakening base of real productivity and income yields diminishing returns. 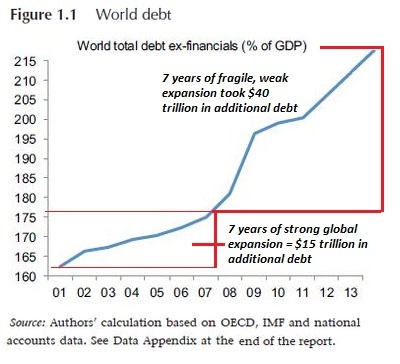 Seven years of strong, widely distributed global growth before the 2008 Global Financial meltdown required $15 trillion in additional non-financial global debt. Seven years of tepid, fragile expansion since 2008 required $40 trillion in additional debt. Meanwhile, earned income as a percentage of GDP has been falling for decades. How can an economy support additional debt if earned income is declining as a percentage of economic activity? It can't. At long last, credit growth is rolling over. The trick of enabling more debt by weakening lending standards and lowering interest rates has now reached diminishing returns. If the American Dream depends on skyrocketing debt built on a weakening foundation of stagnant productivity and income, then it is indeed over. Voters sense this fragile, debt-dependent economy is one repricing away from implosion, and they're uneasy for good reason. Voters are rightly angry that the official statistics mask or manipulate this reality, for if we can't face reality then we have zero hope of solving any problems.